Pairing the best of both breeds is what makes this mix so wonderful, producing allergy friendly family pets with a delightful temperament. 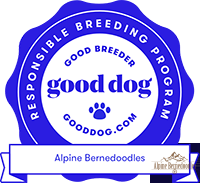 We carefully select our breeding dogs for genetics, temperament, color, health and longevity. Our goal is to combine these attributes to make certain that you receive a family pet that will bring years of love, laughter, joy and companionship into your home. 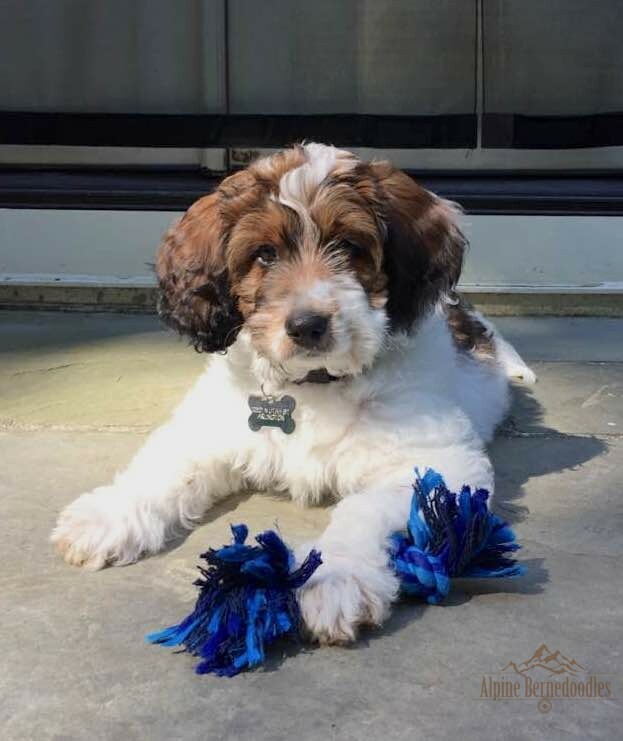 Bernedoodles are known for their intelligence, affection, sociability and goofy cheerful attitudes. They are cute, loyal, friendly, even tempered, gentle and kind. This combination of traits makes them ideal candidates for service, therapy or assistance dogs as well as wonderful family companions. 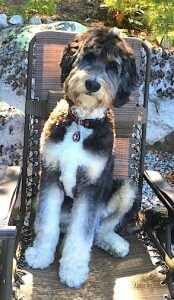 The F1 Bernedoodle can have a wavy to straight coat and we rarely see the curly coats in this first generation. The F1’s have minimal shedding and are great for those with mild allergies. 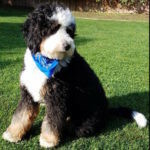 The F1B Bernedoodle’s which are 75% poodle will have a mix of soft wavy fleece coats to more dense curly coats within the litter. The F1B’s will be the most non-shedding and hypo-allergenic. 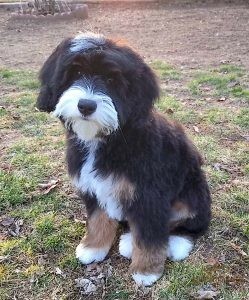 The Australian Bernedoodles will have more of a thick soft fleece coat with mild wave and will have the same hair coat characteristics as the first and second generations of the Berner/Poodle mix. Bernese Mountain Dogs are a true family companion. The Berner was raised in the Swiss Alps as a farm dog to accompany the alpine herders and dairymen. They were used to herd cattle, pull carts, and be a watchdog and loyal companion. They are good natured, self assured and affectionate and generally do well with children and make excellent guardians. They can tend to be somewhat aloof and standoffish to strangers. Unfortunately the Bernese is one of the short-lived dog breeds compared to other breeds of similar size with an unusually high mortality rate due to musculoskeletal causes and a high rate of fatal cancers. Taking this into consideration, I look for longevity in the lines of my breeding dogs, genetic testing and hip and elbow certifications are done on each of my dogs, to ensure that they are worthy of breeding. 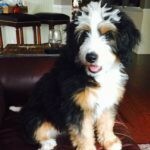 Mixing the Poodle with the Bernese and the influence of the hybrid vigor has shown a significant increase in the longevity of this wonderful breed. No matter the size, Poodles have a playful but dignified personality and keen intelligence. 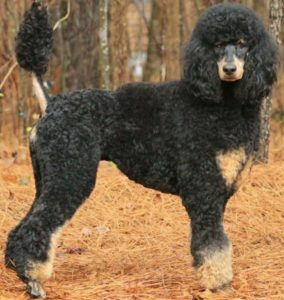 The poodle is no snob, they are people-friendly dogs who want to stay close to their families and are always up for a good game. The poodle’s personality is intelligent, loving, loyal and mischievous. Poodles have a goofy streak and love to play, but they are also eager to please. The ALD was created in Australia by mixing labrador, poodle, irish water spaniel and cocker spaniel. 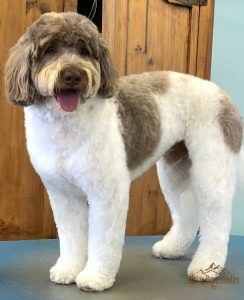 The goal was to take the best attributes of each breed and create the ultimate service/therapy dog with a non shedding coat, along with gentleness and trainability. The Australian Labradoodle is an intelligent dog with a gentle loving temperament that is social, curious and clever. They are athletic, energetic and love to run, swim, fetch or be a couch potato. ALD’s have a sturdy flowing balanced confirmation and beautiful wavy fleece coat that is low to non-shedding and allergy friendly. 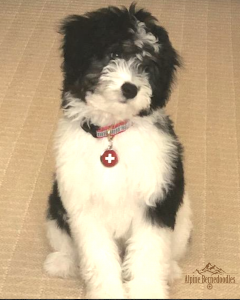 F1 or First Generation is a 50/50 mix and can be Bernese Mountain Dog bred to any size poodle, or a Bernese bred to an Australian Labradoodle which is called an Australian Bernedoode. This pairing is low to minimal shedding and allergy friendly. 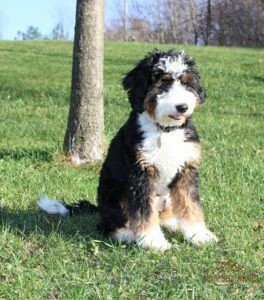 F1B and 2nd gens will be any type of F1 bernedoodle bred back to a poodle. 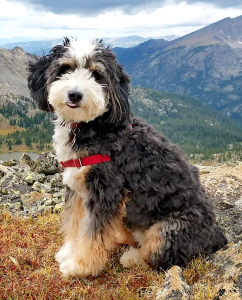 This results in a F1B being 25% Berner and 75% poodle or 2nd gens can be a F1 Australian Bernedoodle bred back to a poodle resulting in 25% Berner, 25% ALD and 50% poodle. These pairings produce the most hypo-allergenic and non-shedding dog. 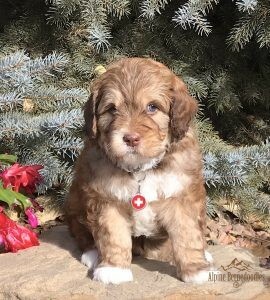 Multi-gens also known as Teddy Bear Bernedoodles are a F1 Bernedoodle bred to a F1B Bernedoodle or multi generation Australian Labradoodle. This pairing will produce a non-shedding and hypoallergenic dog with a more consistent hair coat in the litter. These pairings produce a soft fleece coat with a more stout bone structure and boxy head. The first generation breeding will produce Tricolor, Phantom and Bi-color litters, while the 2nd generation or multi gen breedings will have a variety of different coloring in the litter. 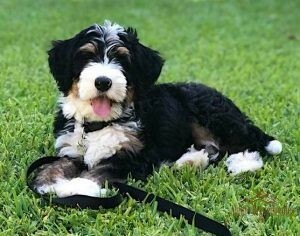 There is NO Australian Shepherd in an Australian Bernedoodle. The size ranges are an average, we do not make any size guarantees. Some can be larger or smaller in a litter. Small Standard: 45-70 lbs and 18-24 inches. This size results from crossing a Bernese Mountain dog with a Moyen Poodle or Miniature Australian Labradoodle. Micro Mini: 15-30 lbs and 12-16 inches. 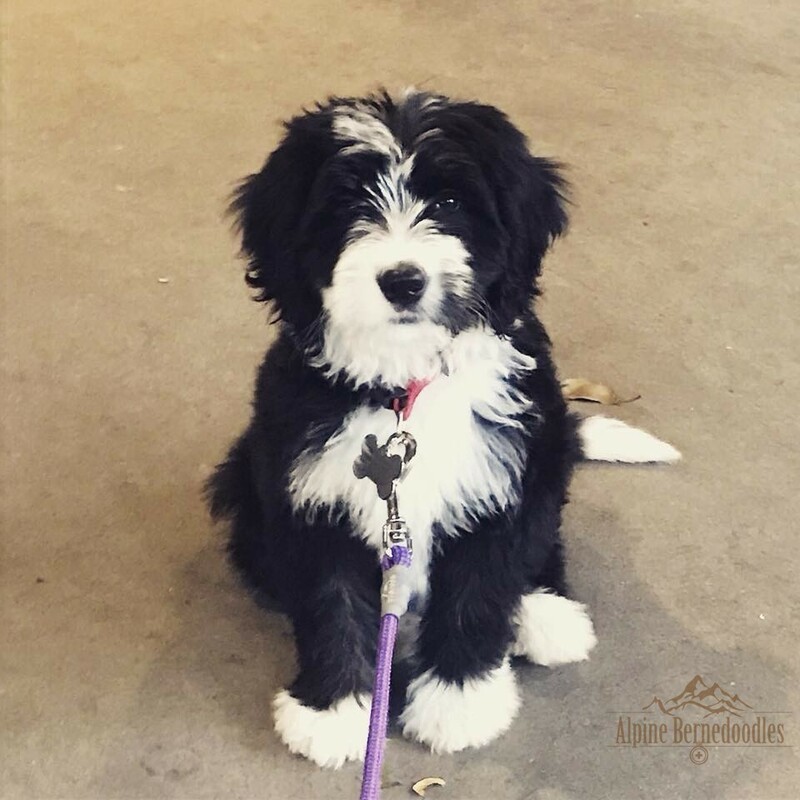 This size results from breeding a Miniature Bernedoodle to a Miniature or Toy Poodle.